New tools area always being adapted to medical professions, and dentistry is no different. 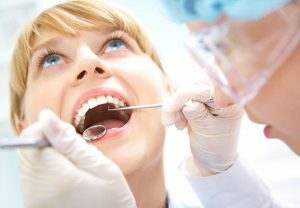 Whether through the use of anesthetic or by refining tooth cleaning solutions, dentists have always been applying scientific advancements to their field. At Mid Wilshire Dentistry we understand how important staying up to date with new technologies is to caring for your teeth, which is why today we’re telling you everything you need to know about laser dentistry. Laser dentistry is, at its core, the use of lasers in order to aid in dental health procedures. These procedures generally involve the removal of small amounts of tissues like enamel or gum tissue, and are helpful in a wide variety of procedures such as reshaping gums or whitening teeth. Of course, there are a variety of different dental techniques and procedures involving lasers, and more than one kind of laser dentistry to get the job done. WHAT ARE THE DIFFERENT KINDS OF LASER DENTISTRY? In laser dentistry there are actually two different kinds of lasers, each with their own wavelength and purpose. Soft tissue lasers have a longer wavelength, which makes them the perfect tool for working on softer tissues such as those in your gums. Soft tissue lasers are used in processes such as lengthening crowns, reshaping gum tissue, and helping alleviate restricted tongue movement. Hard tissue lasers, with their shorter wavelength, can cut through harder tissues like enamel. Hard tissue lasers are used for procedures like detecting cavities and preparing teeth for fillings. There are a wide variety of benefits that can make laser dentistry preferable to traditional dental surgery. For one, the process usually leads to a much easier recovery, given that sutures are unnecessary. Patients also lose far less blood from laser dental procedures than standard surgeries. Laser dentistry is also generally better for the gums of dental patients, because lasers both sterilize the gums while they cut and cause less damage. Finally, laser dentistry is a great option for children who are afraid of the dentist, given that laser dentistry generally requires no traditional tools or anesthesia. In conclusion, laser dentistry is a powerful and effective form of dentistry that enhances comfort, convenience, and safety, which is why we’re proud to offer it at Mid Wilshire Dentistry! Our dedicated professionals can use a wide variety of laser dentistry techniques to make sure your teeth stay as perfect as possible.